Web Home for Equipe SF 2006 - Montreal Outgames! No unclaimed uniforms or team merchandise will be transported to Montreal, so please be sure to pick-up your uniforms at the July 8 event. T-shirts, tanktops and trading pins will also be available for pick-up. A limited number of extras will be available for purchase while supplies last. Equipe SF members provide your own black shorts/training pants and white t-shirt to wear underneath the jacket at Opening Ceremonies in the Olympic Stadium. Click on the pic to see a slideshow of the party! Equipe SF enjoyed a great turnout at our 48-Days-To-Go Party at Metro Bar in the Castro on Sunday, June 11th. Many members travelling to Montreal picked up their fancy new team T-shirts and trading pins, but there were still many unclaimed team merchandise items left. Our LAST UNIFORM DISTRIBUTION PARTY will be on Saturday, JULY 8th @ Metro Bar (3600 16th Street at Market and Noe) from Noon to 7pm. This will be the final uniform distribution event, so if you cannot make it, please contact Brian Jung at equipesf1@yahoo.com immediately. CAVEAT: No uniforms or team merchandise will be transported to Montreal and there will be no additional uniform distribution events after July 8th. Opportunities to individually pick up team merchandise at Brian's home will be very limited, so please be sure to attend our party on July 8 or have someone pick up you items for you at that time! The Equipe SF jacket design incorporates our team logo as well as variations on the Gay and Lesbian International Sport Association/GLISA logo (seen without variation in orange on the right sleeve). The "swoosh" outstretched arm and circle head of the GLISA logo, which represent the open and welcoming hand of friendship and support through sport, are done in a "rainbow" of colors that represent the great diversity of our LGBT worldwide community, symbolically intertwined and gathered together, much like we will be in Montreal for the 1st World Outgames 2006. A rainbow-colored "Pride" version of the Equipe SF logo is found on the lower left sleeve, above the "USA" emblem. The right sleeve features the word "CALIFORNIA" while our hometown "SAN FRANCISCO" is prominently featured on the front. Equipe SF members provide their own black shorts/training pants and white t-shirt. The jackets along with the green bucket hat and Equipe SF logo complete the outfit. 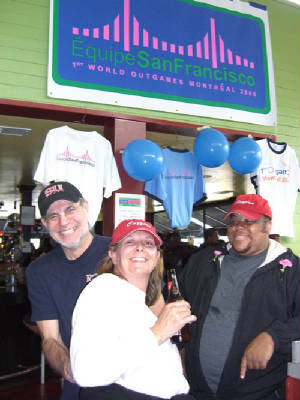 Kathy Fleming (center with red cap) of San Francisco was the Grand Prize Winner at the Equipe SF Welcome and Registration Party held at The Cafe on Saturday, October 22nd. 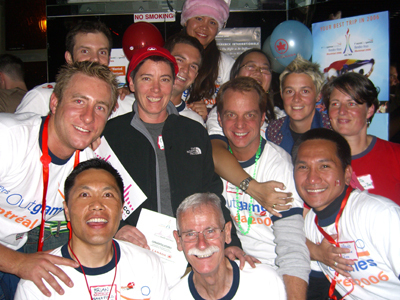 The event was a huge success and attended by hundreds of athletes, artists and supporters of the team headed to the 1st World Outgames Montreal 2006. Click here for more Party coverage! "Equipe" (pronounced eh-keep) is French for "Team" and in the spirit of preparing for the 1st World OutGames Montreal 2006, Equipe SF has been established as the team of athletes, artists, activists, volunteers, and supporters that will represent San Francisco and the Bay Area in Canada at next summer's premier global LGBT games and cultural festival. With Team SF in Chicago and Equipe SF2006 in Montreal, San Francisco will be well represented in worldwide celebrations that will enable us to share in unity and fellowship through art and sport! Join Us as the Team from San Francisco! Please get in touch to offer comments and join our team and mailing list.